Times Music, one of India’s leading record labels and music publishers, and Speed Records, the leading music label in Punjab, join hands to offer their audience a wider choice of music and help grow the Punjabi music genre across India and in global markets. 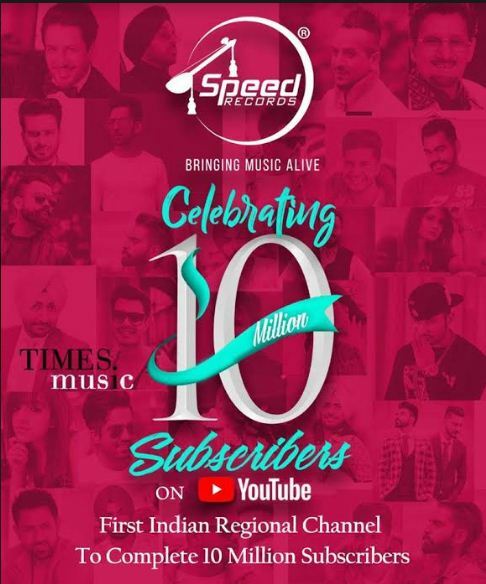 An initiative started in December 2017, Speed Records YouTube channel, with the help of its partnership with Times Music, now hits 10 million subscribers on YouTube. Since its inception in 2004, Speed Records has been a promising label promoting and publishing world-class Punjabi music by working closely with the finest artists of the Punjabi music Industry. The catalogue offers an expansive range of Punjabi music across different genres and boast of an artist roster that includes all the top-rated Punjabi singers from across the globe. "I would like to congratulate the team for their tremendous effort. Our collaboration with Speed has been fruitful. We are definitely looking forward to achieving even greater heights with our collective dedication to offer quality content to our audience," said Mandar Thakur, COO of Times Music. “Collaborating with Times Music was indeed one of the best decisions taken by Speed in recent times. Hitting 10 million subscribers on YouTube is a result of our immense hard work and dedication. Such high numbers confirm that we are growing at a steady pace and in the right direction. Our numbers inspire us to push our limits, create better content and cement our place as the Number 1 Punjabi music label in the world” said Satwinder Singh Kohli, Director of Speed Records. Times Music and Speed Records collectively have succeeded in increasing viewership & subscriber bases with their offering of quality music videos, and aggressively promoting their content and artists across various formats. Efforts that have resulted in it becoming the No.1 Punjabi music channel on YouTube, and the only regional Indian music channel on YouTube with 10M plus subscribers from across the globe.